In this article, we are going to investigate how a business can measure a customer satisfaction score (CSAT Score), and how important this metric really is. What does a good survey look like? Customer Satisfaction (CSAT) is probably the most widely recognised measure of customer sentiment used by businesses. Yet, there is no universally recognised approach to measuring a CSat score. Far from making this a useless metric, the lack of a specific definition means that businesses are able to tailor CSat measurements to the needs of their own business. Here are four approaches that are commonly used by businesses of every size. One method is to calculate the mean average of all the scores combined on a scale between 1 and 10. Surveyors simply ask a question like “How satisfied were you with our service today?” The result is data that can easily be represented as a percentage. Unlike some other scoring systems, this approach does not need to group any scores, and so places a greater emphasis on score distribution. This helps project owners to investigate the common experiences of low-scoring customers, identifying key pain points. 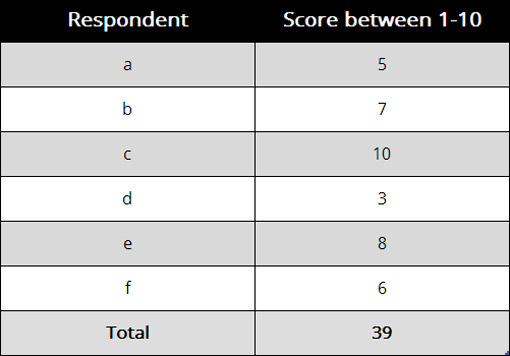 Perhaps the easiest way to generate CSat data is with a simple happy/neutral/unhappy question. The results produced by this method do not need a large amount of analysis, and surveyors have the option of following up by asking customers about what could improve the score. This method also manages to account for cultural differences better – research in Psychological Science has shown that individualistic cultures score more in the extremes, while other cultures score towards the middle. This system doesn’t generate particularly nuanced data, but it can produce a quick health check on feelings towards a brand or service. Because it is so easy to link it to a graphical representation, it also reduces effort for the respondent. Used by major services like Amazon and Netflix, the Star Rating system has the benefit of being familiar to customers. Because it is so familiar to consumers, businesses can advertise the percentage of customers who gave them a five-star rating. 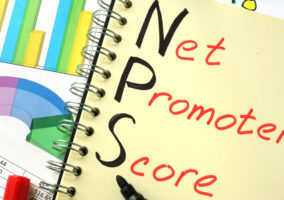 Net Promoter Score (NPS) is another metric of customer experience, often thought of as the loyalty metric. Most enterprises calculate both NPS and CSat, often using different scales for each. 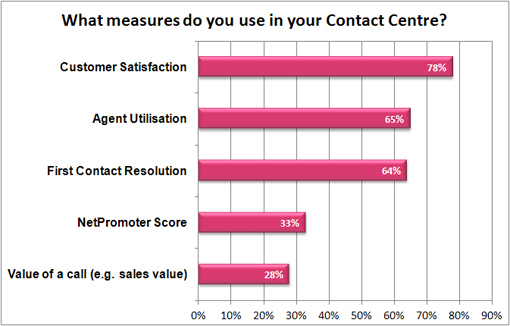 However, the standard methodology for NPS can also be applied to CSat for a more nuanced understanding. With NPS, users are always surveyed on an 11-point scale from 0 to 10, with responses grouped as detractors, passives, or promoters. Once the responses are grouped, the number of detractors is subtracted from the number of promoters and averaged against total respondents. Rather than a percentage, this calculation generates a whole number between -100 and +100. Is It Important to Understand CSat? Fundamentally, satisfaction is about customer retention. The average company loses half of its customer every five years, leading to a need for constant replenishment. 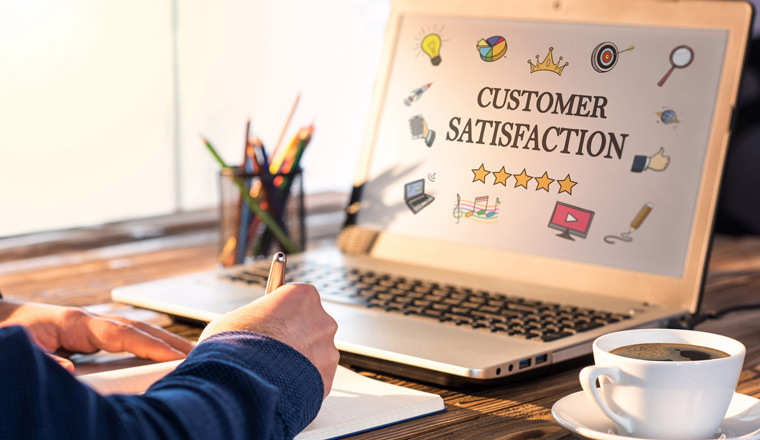 According to Customer Experience author Jeff Toister, surveying CSat can limit customer loss by allowing enterprises to “…eliminate pain points and improve customer loyalty. So, providing good customer support is important – what about CSat as a metric? For the contact centre and other customer-facing areas of business, CSat provides simple targets, and flags progress to management. As with any metric, it is the underlying data rather than the score that matters – but the score can be a useful way to communicate complex data quickly. CSat surveys are also a good way to understand what customers value in a business. 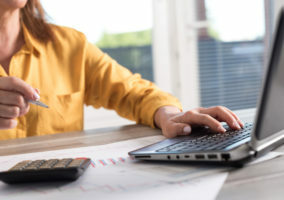 As customer survey expert Teresa Gandy put it, “Businesses don’t always know what it is that brings their customers back. That information is important, because it could be your marketing material, your hook for attracting new customers. Based on a combination of CSat score and NPS, customers can be segmented further. Some choose to do business with you through a sense of identifying with your brand, while others opportunistically respond to incentives like pricing. Customers who score somewhat poorly are likely to leave, and when low satisfaction is coupled with low NPS, customers may generate negative commentaries. Armed with this information, customers service and retention teams can do much more to tailor their communications and foster better outcomes. There are also some common issues for businesses when measuring their levels of CSat Scores. A basic principle for companies that want to solicit consumer feedback is “act on what you learn”. If you’re not changing your strategy based on new information, why even bother to ask? But there is another side to this. How do you know that what you’ve learnt is relevant? While it’s a problem to ignore good feedback, it’s much worse to act on unrepresentative feedback. Jeff Toister comments, “A lot of customer service leaders worry about their response rates, but I emphasize two things that are much more important. One is representation. Does your survey sample (the people who respond) fairly represent the customers you want feedback from? The second is usefulness. Do you get useful data that you can use to improve customer service? Between 1995 and 2015 the response rates for online surveys dropped from 20% to 2%. That number includes non-targeted surveys, so it’s not a direct parallel with the way businesses survey their customers. Nonetheless, it does tell us something about public willingness to engage. The average consumer is invited to participate in three surveys a week, and fatigue easily sets in. Businesses need to have clear rules on the frequency with which they will survey a customer, and the amount of time they are going to ask respondents to give up. What does a customer mean when they confirm they are satisfied? Does rating 5 out 5 mean they are fully happy or that they completely agree that they’re quite happy? This is largely an issue of how a business chooses to word its survey questions, and what they take away from the responses. Teresa Gandy thinks satisfaction might not be an adequate target: “I have big issues with using the word ‘satisfaction’. Satisfied customers will go to the competition when there’s an offer on – loyal ones won’t. High levels of satisfaction do correlate with customer loyalty, which is one of the most useful characteristics to measure. 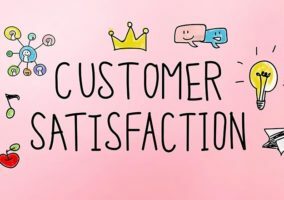 As this is only true of the most satisfied customers, an increasing CSat score does not necessarily tell a business much about their ability to increase retention. Businesses have to choose the scoring method that best fits their survey goals. If they handle scoring internally they might create their own system entirely from scratch; if they use an established survey company, that company will have its own preference. In practical terms, this makes it impossible for businesses to compare their results against their peers. It can also make it challenging to communicate positive results to customers and stakeholders. Without a very large surveyed group, individual surveys can have a big impact on scores. This might not be a problem for large companies that are able to poll thousands of people; for smaller companies, it could be a major difficulty. This is really an issue with survey technique rather than the CSat metric. The area where this is most troubling is when customer feedback is used to measure individual members of staff. In theory, basing targets and bonuses on individual CSat seems very intuitive. The problems arise when only a few customers respond. Scores which are fractionally different can have an impact on agent confidence, even though they may be random fluctuations. Is There a Best Way to Gather Survey Data? Businesses have more options than ever before when it comes to surveying customers. 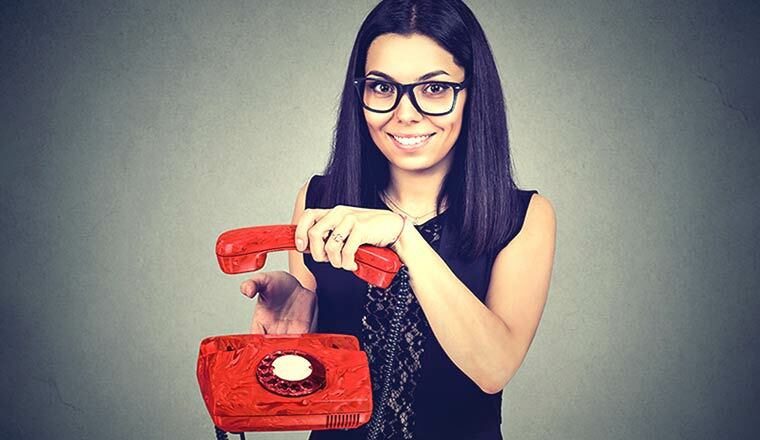 Website, phone, IVR – there are numerous options with different benefits for cost and response rates. Teresa Gandy told us, “The best way to get survey responses is mobile phones. Not SMS, but texting the link to the survey. Almost all CSat data is sourced from surveys, so making sure that surveys are fit for purpose is vital. These are a few of the most important considerations for putting together a survey. The average customer will devote around 90 seconds to completing a survey. That’s enough for a general CSat question, a question about their specific experience, and an NPS question. Jeff Toister says, “A good survey should have an odd-numbered scale because an odd number of scale points gives participants a middle-ground or neutral response option. Believe it or not, there are things that many customers just don’t care about either way. A major annoyance for customers completing surveys is finding that they are obliged to answer questions which are not relevant to them. Obviously, businesses should target their surveys to avoid irrelevant questions in the first place. But, as a contingency, customers need the option to select something like “I don’t know”. The information that customers volunteer in text fields is often the most useful. However, adding text should be optional, or else many customers will simply give up. Bear in mind that ticked boxes are going to be very easy for you to process, whereas a large volume of text needs to be read through and understood. “I generally recommend including an additional comments box, because if they do feel passionate and you haven’t given them the option, it’s going to annoy them. But you don’t need more than one comments box. All of the information provided above is really helpful!